Gutter systems prevent rain water from going directly to the foundation by routing it to the main downspout. It thwarts the accumulation of water around your home. Water will cause foundation issues if it is not addressed properly at the roof. Installing copper gutters provides the protection your home needs against water damage while adding value to your home at the same time. 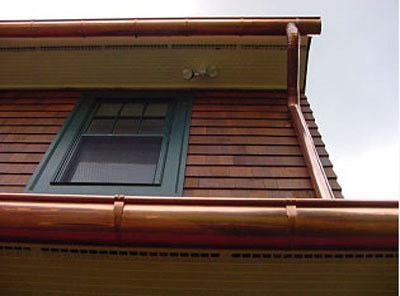 Copper rain gutters are durable and will protect your home for the lifetime of the home. Additionally, they will contribute to the aesthetic appeal of your home, improving it's appearance and curb appeal. Copper Gutters are available in various sizes, the standard 5-inch to much larger circumferences. Copper gutters are manufactured from premium quality copper. Don't let leaks or poorly dealt with rain get the worst of your home. Have acopper gutter system installed for practical and beautiful water damage protection. Contact Custom Insulation Company Inc. for quality installation of a copper gutter system.